As a Superintendent of police, I earnestly wish to provide full proof crime control system and to make people live in peace and tranquility. Godda police is making untiring efforts in protecting the innocents, punishing the culprits, caring for victim and acting fairly in favour of all law-abiding citizens. Our motive to accelerate the criminal justice system by protecting the life, liberty and dignity of the downtrodden people of the district will continue as ever. The district only thriving industrial unit (a coal producing unit as Rajmahal project in Lalmatia) is the main sustenance of the local population. Other industrial activities such as Jindal Power Plant, Jindal Coal project are also likely to operate in the district in near future. We provide utmost support and security to the industrial unit and wish success to them. I hope the industrial units will accelerate great economic activities in ameliorating the distress of the common people of the district. Although this District is in first phase of Naxalism, which is by product of illiteracy and unemployment, particularly educated unemployment. The disparity in society, the gap between haves and have-not must be bridged, if really, we want all round development of all sections of society. Any job assigned to us must be done with utmost sincerity, honesty & dedicating then only we can do justice to the society, district, state, country and ultimately to whole world. The Godda District came into existence in 1983; previously it was a sub-division of Sahebganj district of the undivided Bihar. As per census of 2001, total population of Godda District is 10,47,939 which includes male 5,44,043 and female 5,03894. The total scheduled caste population is 89,698 and scheduled tribes population is 2,47,538. Godda district has nine(09) revenue Block shuch as 1. Godda 2. Poraiyahat 3. Sunderpahari 4. Pathargama 5. Mahagama 6. Meharma 7. Thakur Gangti 8. Boarijore and 9. Basantray. 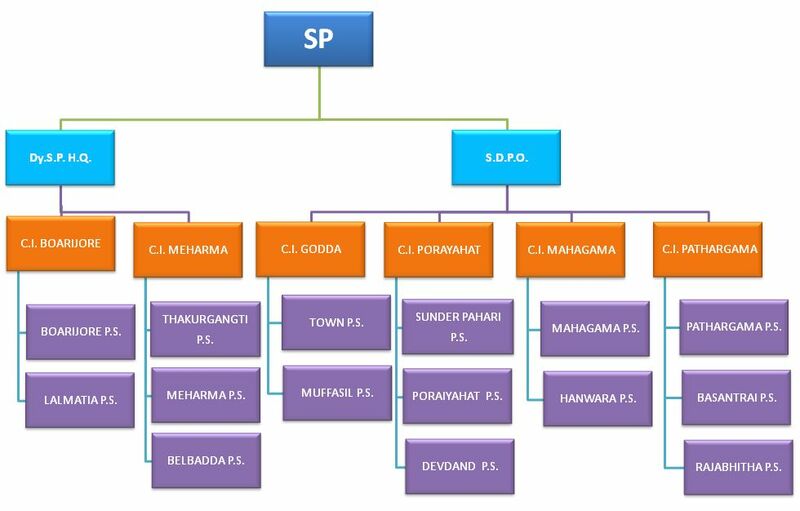 For the convenience of Police Administration under the criminal justice system the district is divided into one(1) Police Sub-division, Five(5) Police Circles, Fifteen(15) police stations in which Hanwara p.s is notified by the notification no-10/P-1-358/2005,14/D.S, Dated-28.02.09 of Home Dept of Jharkhand govt., a new p.s in Hanwara is notified by the notification no-10/Thana-110/2010/3461 Dated-08.08.11. of Home Dept of Jharkhand govt and Lalmatia & Basantroy p.s. are notified notified by the notification no-10/Thana-110/2010/3463 & 3462 Dated-08.08.11. of Home Dept of Jharkhand govt. Keeping in mind the immediate danger created by naxal activities all the police stations and outposts of this district have been alerted to counter anti-socials. All the police stations have been fenced with boundary walls. District arms and ammunitions magazine is in the Town police station Campus of this district which is kept under strong vigil. Seventy seven Constables, Eighteen Havaldar and Seven jamadar have been trained as S.T.F to counter the naxal activities in the district. Seventy eight newly recruited constables are trained special jungle warfare training in Netarhat. The trained constables will sufficiently and adequately strengthen the security scenarios the district. Modern police building have been constructed in Godda Town p.s, Godda Muffasil p.s, Sunderpahari p.s, Mahagama p.s, Barijore p.s, and Poraiyahat p.s. as per security measures. Also a new police building is being constructed for Lalmatia p.s. The new building may be ready within four months and will enhance the security scenario of the concerned police stations. Although the district has eleven orginal police Stations Viz-(1) Godda, (2) Poraiyahat (3) Sunderpahari, (4) Pathargama (5) Mahagama (6) Boarijore (7) Meharma, (8)Hanwara, (9)Lalmatia(recently notified as p.s), (10)Basantroy(recently notified as p.s. ),(11) Rajabhitta(recently notified as p.s) and four subsidiary police Stations Viz (1) Godda Muffasil (2) Deodand, (3)Belbada, (4)Thakurganti are also functioning and awaiting to be upgraded by the govt. Many police stations have fortified morchas and their fenced boundaries except Mahagama/Thakugangti/Belbada p.s. Recently notified police station (1) Hanwara p.s (2) Basantroy p.s and (3) Rajabhitta have no own building. For these police station need modern p.s building and barrac. 1. Devdand PS- Watch Tower & Toilet 2.Sunderpahari PS- Watch Tower & main gate 3.Poriyahat PS- Watch Tower & main gate. The all works are in progress. Proposal of six new outpost such as 1. Bisha pahar 2. Dande 3 Bhagaiya 4. . Ghatiyari, 5. Damru and 6. Raha have been sent to the police headquarter. 3. Nafisuddin Ansari -- 1 -- 1 04 Danda, 01Mobile 4mt. Rope. Godda police has organized several police public functions and distributed Cycle, Mobile Phone, Solar light, Jursy, Laltern, Torch, football, boot, hause etc among the poor persons. Five days tournament of football match was also organized in tribal and paharia dominated villages in Sunderpahari police stations. The police activities in remotest villages created a friendly atmosphere between police and public. Cycle & Rickshaw race was also organized by Godda police in which Cycle, Mobile Phone, Solar light, Jursy, Laltern, Torch and many handsome prizes were distributed under police public community policing. On 15th August 2011, the district police has organized a football match between girls schools in Godda Gandhi Maidan and handsome prizes such as track suits, trophy, football nets etc. has been distributed among winners and looser almost equally. Prizes were distributed by D.C and other important officials just to enhance the moral of the children. This activity was a part of community policing to bolster the moral of public as well as small school going girls. This step of Godda police was widely appreciated by media as well as intellectuals. The approach of community policing has provided new dimension to the people in the district and they are coming closer to the police administration for solution of even petty problems. Women cell of the district has resolved at least five hundred matrimonial disputes for the last three years. Most of the family disputes arising out of husband wife tussle are being very successfully settled and life of common people have become easier to a great extent. The district police plays very important role in organizing meeting of Mahila kosang(Women cell) on every Sunday with their reputed members coming from all walk of life. 1 Godda Puchari @ Radha @ Sukurmuni D/o-Kisan grihi R/o-Paharpur Ps- Sundarpahari Distt-Godda. CPI (Maoist) Member 12-04-2017 Ex-Gratia – Rs. 50,000/- Total Rs.-50,000/- 1- Rehabilitation. 2- Land allotment for house bldg. 3- House rent. 4- Tution fee. 5- Govt. job. 6- Vocational trg. 7- House bldg.